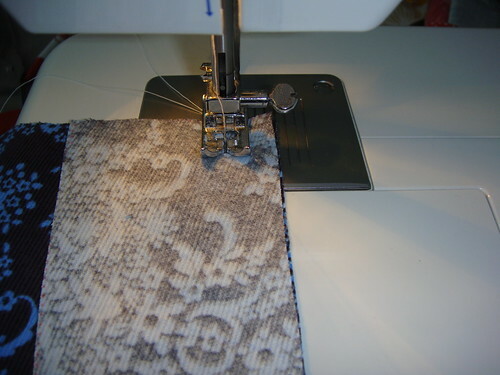 Thanks for your patience with today's sew-along steps...this post doesn't have pictures yet. Still. Because there's a serious breakdown happening with my computer. But I figured I'd put up some words and then add in the pictures when I get to stop fighting with technology. **Please read through entire post before doing any sewing! We're assembling the bodice and sleeves today, and your Schoolhouse Tunic will start to becoming recognizable as a shirt! You will need to set aside the skirt front and skirt back pattern pieces for next week; we will be using all the other pieces today. *Note: I altered the neckline of my bodice freehand with scissors by placing both bodice pieces and both placket pieces together and trimming away until I achieved a neckline that was less constricting. Because my neck is claustrophobic. The original neckline is shown above, altered version below. 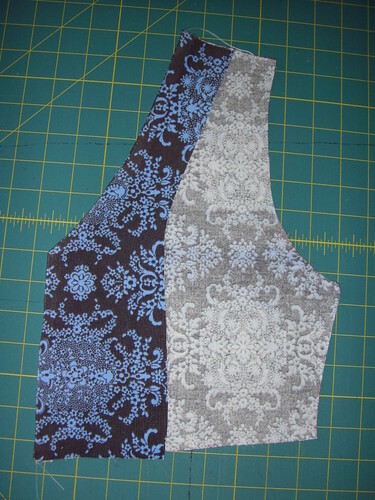 Place one of your bodice fronts and one of your plackets right sides together. 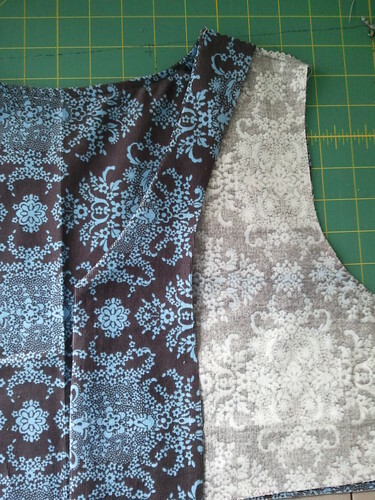 Make sure you're using the correct placket for the bodice piece -- the curved edges of each should match up. Sew to the pointy piece of the bodice and then pivot [needle down, presser foot up] and sew the rest of that side. You will be sewing with a 5/8" seam allowance, which is weird for most quilters! My machine isn't all fancy and I can't move the position of the needle more than 1/8", so I just have to line up the edge of my fabric with the mark on my sewing machine plate. 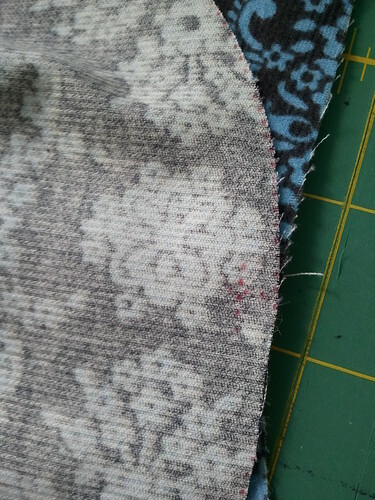 After you've sewn that seam you can finish the seam with pinking shears. I don't have a serger and this particular seam will be encased in the end anyways. I pink the edges just for extra peace of mind. You also want to clip that little pointy corner, just like you would clip the corner of a pillow cover. 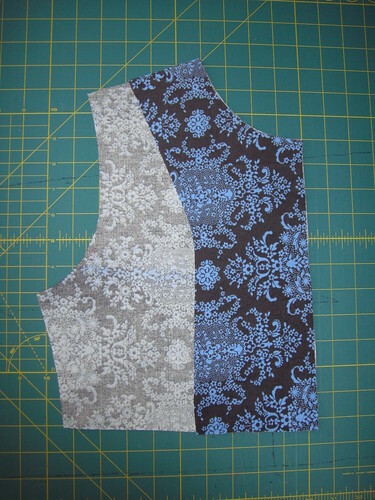 Turn the new front bodice piece right side out and press out the corner that you just clipped. Press your seams. 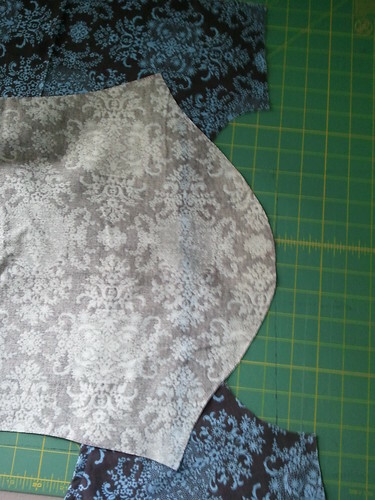 Do the same thing to the other front bodice and placket pieces! 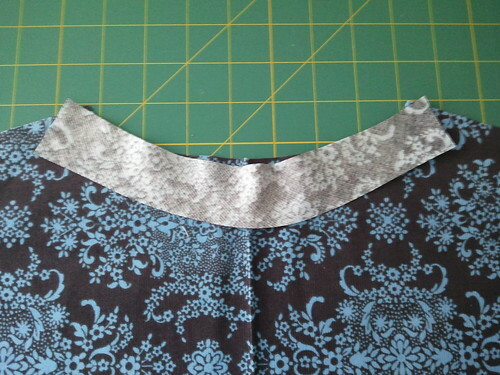 Now take your bodice back and your bias binding strip. I remember when I first made this pattern that I was so confused by this step. I've since determined that the diagram at this step is super unhelpful and confusing [or it was for me]. 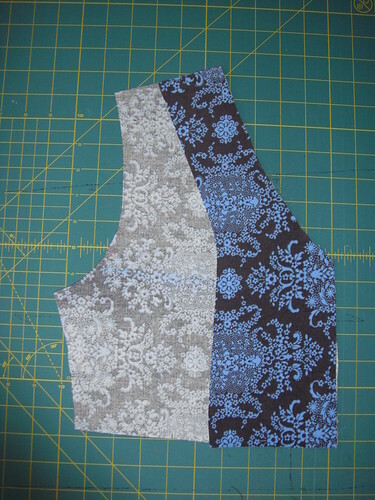 Pin the binding strip to the neckline of the back bodice piece, right sides together. 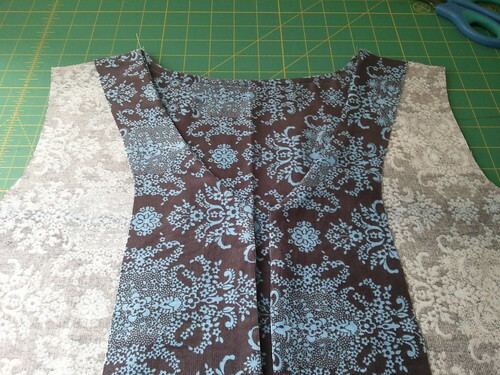 You will line the top of the binding strip up with the neckline of the bodice. 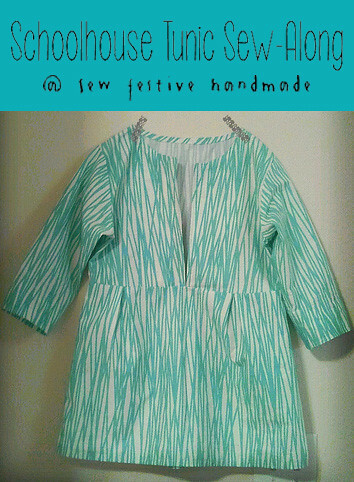 Sew with your 5/8" seam allowance, taking it slow around the curves. 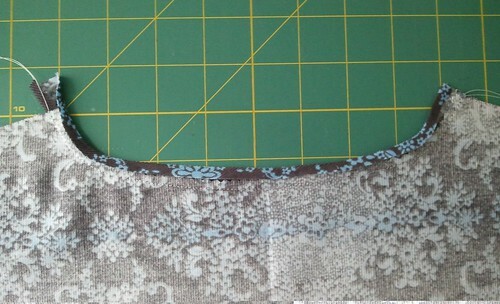 The diagram for this step shows what the inside of the bodice back looks like after you sew on the binding strip. 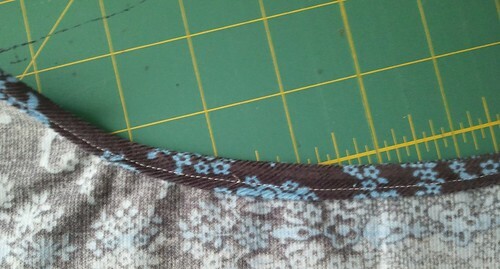 It is NOT an indicator of how you should be sewing the binding strip on as indicated in the first sentence of step 3a. 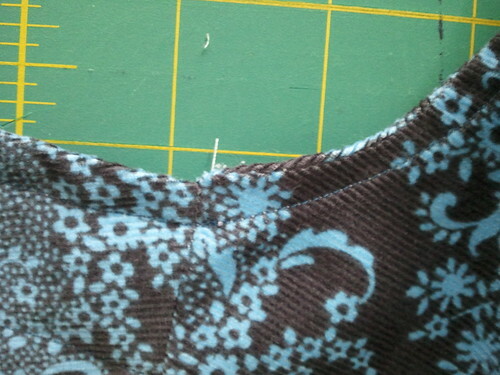 Then trim the seam down to 1/4". 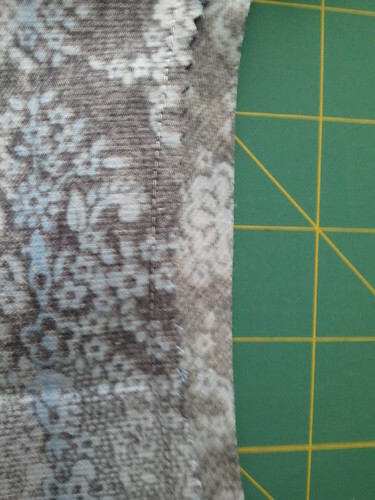 Press the raw edge of the binding in 1/4" and then fold and press another 1/4". At this point there should be no raw edges. Topstitch the binding in place. At this point [and a couple other places] you want to think about what you want the topstitching to look like. You can try to blend, like I did for mine, or you can choose a contrasting thread for topstitching for a different look. 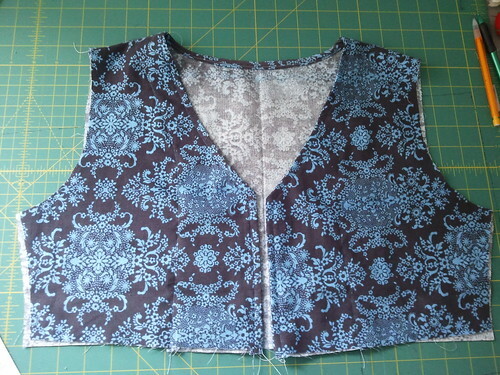 Lay the bodice back out flat with the right side facing up. 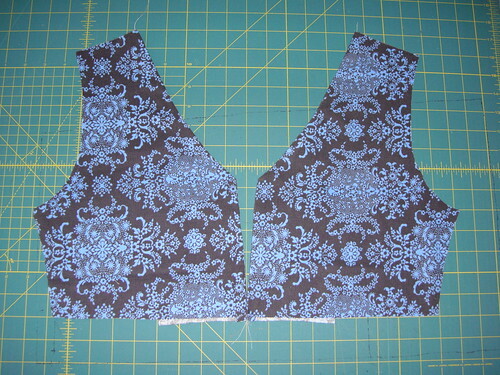 Place each bodice front on top with right sides facing. 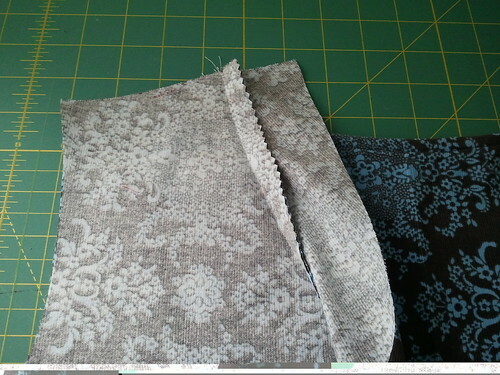 You want to pull the loose flaps of the plackets out of the way and sew the shoulder seams. 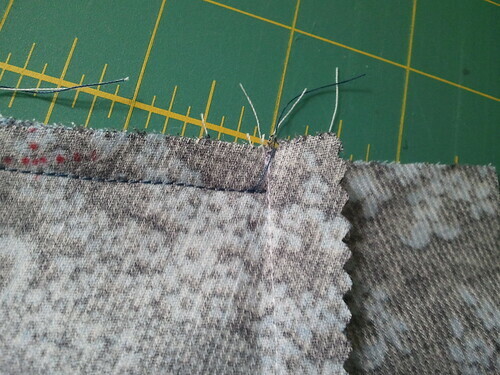 This particular seam is 1/4" so make sure you move your needle/your fabric over from what you've been doing! 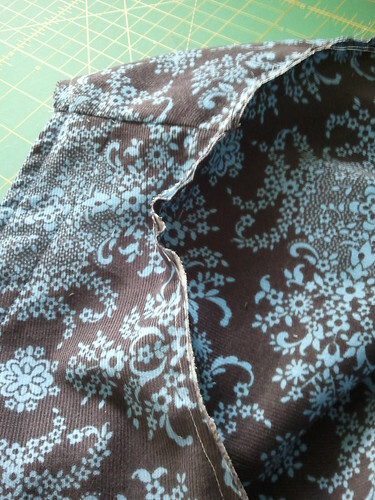 Make sure you end the shoulder seam on the seam from sewing the placket to the bodice. 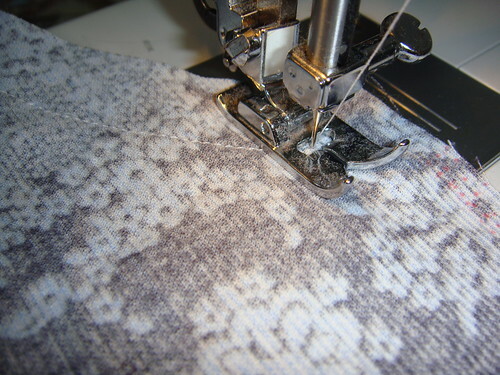 You can finish the seams with pinking shears again, or you can zig zag stitch them. Or you know, if you're fancy and have a serger then you can use that. 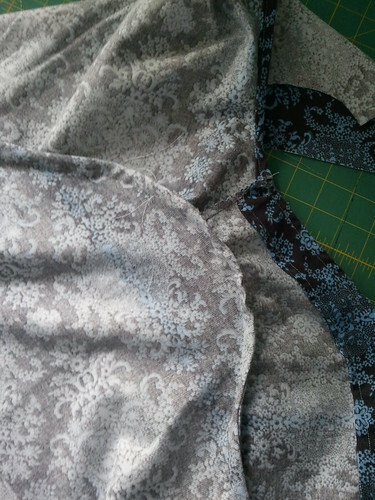 Now, if you're feeling adventurous you might want to finish all seams with a French seam. I wanted to show a variety of seam finishes in my pictures, so I didn't do that here, but you can certainly choose that option! 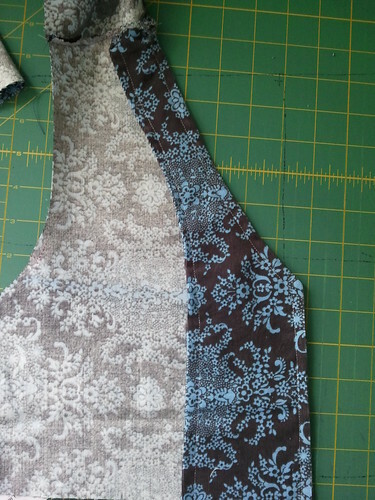 To do a French seam at the shoulders, you will need to finish the edges of the placket first [so follow the steps below in the Finishing the Bodice stage of the instructions] by turning them under 1/4" and topstitching. 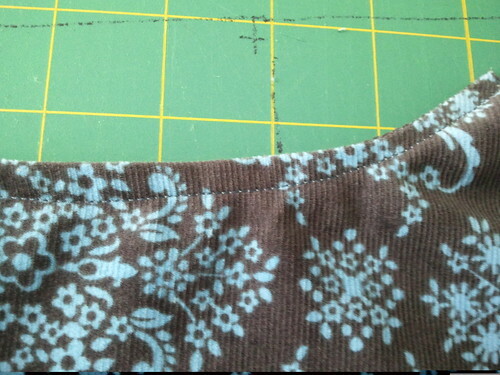 You will then put the shoulder seams WRONG sides together, and stitch 1/8", turn right sides together, press seams flat, and stitch 1/8" again. 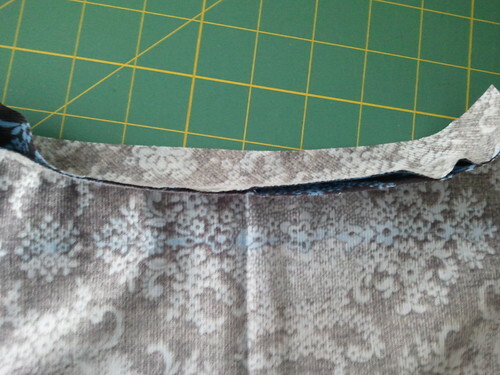 To finish the bodice you will need to turn the raw edges of the placket under 1/4". 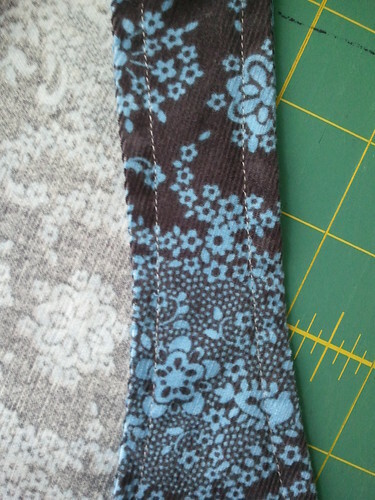 Topstitch along the side of the placket that is closest to the sides first. 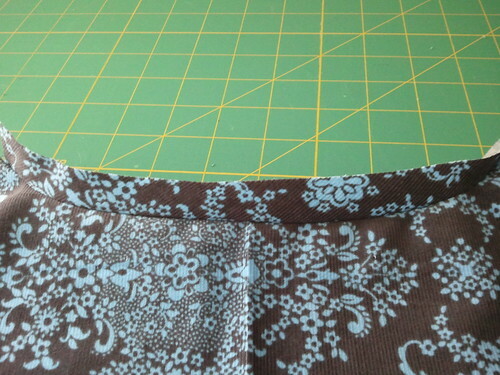 I topstitched 1/8" [ish] away from the edge of the placket. Then topstitch the other side of the placket 1/4" from the edge, going all the way around the back of the neck. I actually matched my stitching up with the stitch line from the neckline binding, but Meg suggests that you double-stitch the back neckline for extra stability. I just like the look of a single line of stitching better, and I can certainly add another line of stitches if necessary in the future. On to the sleeves! You're doing great! I actually completely skip step 6a, so yay! Why? I've never had a sleeve that didn't fit in the bodice armholes! I remember doing all the gathering with my first tunic, and then I was so annoyed because it made the sleeve too small. You can certainly do the gathering, but before you spend all that time, perhaps pin the sleeve into the armhole and see if it's necessary. 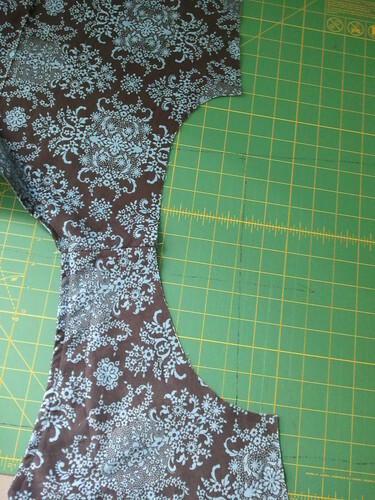 You can follow the sleeve steps as instructed in the pattern and then trim the seams with pinking shears or finish them with a zigzag stitch. I was all about the French seams because I've never done them on a sleeve before. 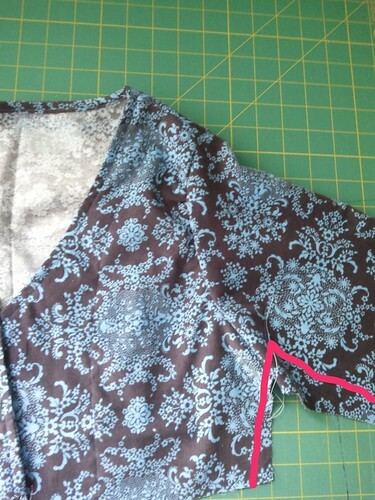 Place the sleeve wrong sides together and pin the marking on the sleeve indicating the middle into the shoulder seam of the bodice. 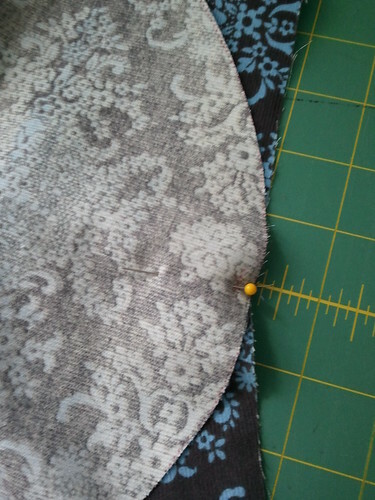 Sew a 1/4" seam, taking your time around the curves. 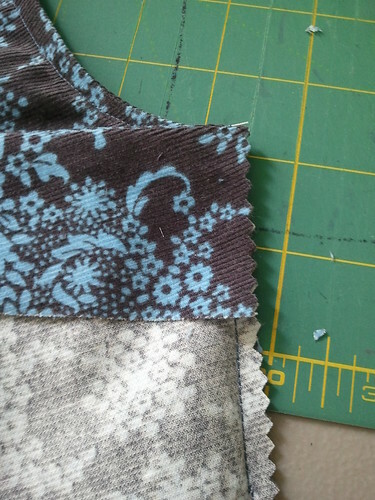 Press the seam flat and then sew a 3/8" seam allowance to encase all raw edges. Sew the side seams of the bodice together by either sewing a 5/8" seam right sides together and pinking/zigzagging or French seam it using the same process used for the sleeves. You want the sleeve seam to match up under the arm. Mine was off a smidge, but it's hard to tell with my print. Hey! You have a bodice! This is so exciting! Also, this was the hard week of sewing. It's so easy here on out! I myself will be altering my bodice this week. I'm going to let out the sleeves a bit to get a fit I like a little more for long sleeves. Which leads me to something I want to touch on -- what if it doesn't fit?! First of all, you can try it on as you're sewing. I recommend it! What can you do if it's too small but you already cut your pieces out? You can then sew all the seams with 1/4" instead of 5/8", which will provide you with over half an inch all around of extra ease. That's what I'll be doing at my sleeve seams to give me some more wiggle room, as the corduroy is a bit bulkier in that area than I anticipated. If you're a little worried about your bodice being a bit snug then I might recommend that you not sew French seams because they are a pain to adjust!